Fill out our simple form and get quotes from local buffet caterers. Buffet food is a firm British favourite and a great option for any event. Cater for a range of guests, diets and preferences by selecting buffet menus that perfectly fit your needs. Buffet catering covers all budgets and is a really flexible option. Our collection of buffet caterers offer a great choice of specially selected food and a range of cuisines; definitely more than just cheese and pineapple on sticks! 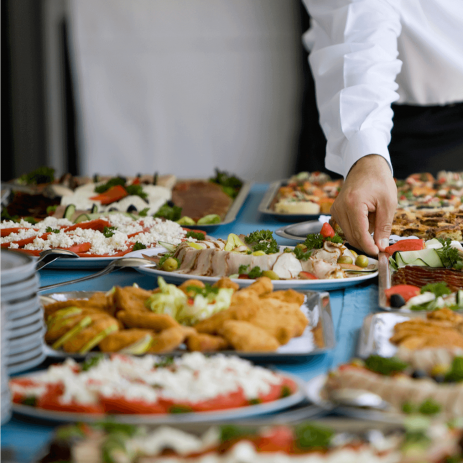 Use our quote request form to find available buffet caterers in your area. We can produce a number of buffets from finger to hot and cold fork buffets, tailored to your needs. These are for Private and Corporate Events of any size! We offer a range of buffet options to suit all tastes and occasions, including hot buffets, cold platter style buffets, finger food, high tea and dessert buffets. We offer quality buffets at an affordable price, whilst giving outstanding customer service. Please look at our outstanding reviews. From small parties to large gatherings, we can provide the perfect buffet for any occasion! We're a family run business based in Northampton that cater for buffets. We provide catering for everything from weddings to corporate events with numbers from 30 to 500. Perhaps you’re looking for wedding buffet caterers, caterers for a business event or funeral – we’re here to make organising your event simple. Buffets are a great option, whether it’s a light afternoon tea style finger buffet or something more filling with a number of courses, the buffet caterers we have listed on our site are trusted professionals who’ll work with you every step of the way to make your event a success. You’ll find locally sourced ingredients, world cuisine such as Polish, French and Indian, to name but a few - another great way to add something unique to your special event. Browse our suppliers for inspiration or complete our simple quote request form to hear from suppliers in your area.